It’s maddening when government organizations which are supposed to protect the public against terrorism and crime, trade logic and proficiency for appeasement and political correctness. Think TSA officials searching a 95 year-old woman. Unfortunately, Israeli officials seem to have taken a page out of the TSA handbook on how to humiliate its own citizens while placating its enemy. Muslim clerics in Israel are notorious for crying “wolf!” (i.e. “Jew!”) causing the Israeli police to spring into action. For example, whenever a Jewish holiday approaches, Islamic clerics work their followers into a frenzy over the possibility of Jews visiting the Temple Mount. Recently, before Jerusalem Day, the day that marks the reunification of Jerusalem and the liberation of the Temple Mount, a leading Muslim cleric, Sheikh Yousef Ideis, made such claims. He warned Arabs to "be alert for possible infiltration of fanatic Jews" onto the Temple Mount. Instead of ignoring the obviously staged incitement, the Israeli police validated the cleric’s claims. According to the Israeli police, “fanatical” Jews did “infiltrate” the Temple Mount on Jerusalem Day. Rabbi Yisrael Ariel was one such “fanatical” Jew. His actions were so fanatical that he has been barred indefinitely from ascending the Temple Mount and is under criminal investigation by the Israeli police. 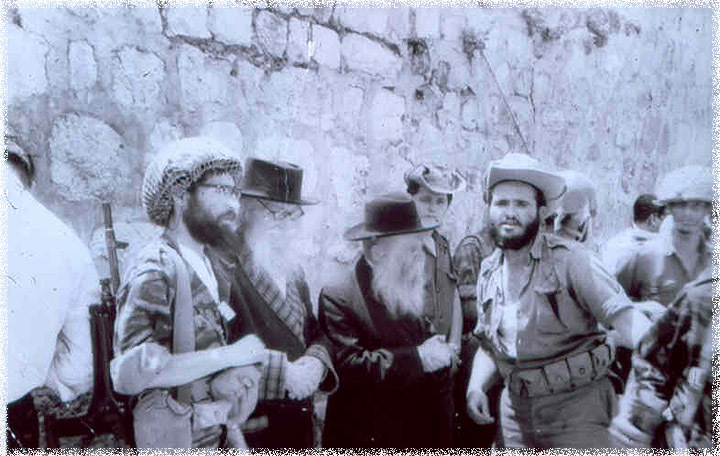 Rabbi Ariel, who is 78, fought in the 1967 Six Day War. He was one of the famed Israeli paratroopers who took part in the liberation of Jerusalem. He was at the Temple Mount when Lt. Gen. Mordechai Gur famously declared, “The Temple Mount is in our hands.” What elation Rabbi Ariel must have felt that day. The elation was mixed with grief though, as 180 of his fellow comrades fell that fateful day. As you can imagine visiting the Temple Mount on any occasion is special for Rabbi Ariel, founder of the Temple Institute in Jerusalem, but especially on Jerusalem Day. Marking the 45th anniversary of the liberation of the Temple Mount, Rabbi Ariel along with other Jews, including Knesset members, visited the Mount. Surprisingly they were left uninhibited by both the Islamic Waqf officials and Israeli police and so they sang and prayed. The special moment was captured on video and Rabbi Ariel can be heard saying, "I have waited forty-five years to be able to say the Shehechianu (literally, "He who has kept us alive,") here on the Temple Mount." He then said a memorial prayer for his fallen comrades. After Jerusalem Day, Rabbi Ariel tried to ascend the Mount again, but to his surprise was prohibited from doing so by the Israeli police. He was informed that he was barred indefinitely from the Mount and that he was under criminal investigation for actions, “that were not in compliance with the law.” Which begs the question, which law? Sharia law? The lauded democratic law in Israel assures the freedom of all religions at holy sites. How pathetic that the Israeli police and government would set aside their own laws, logic, and decency to capitulate to the demands of Muslims. Who would have thought that Jews, of all people, would be criminally investigated for praying on the Temple Mount? But due to “delicate status quo agreements,” (which translates into the asinine belief that appeasing Muslims will somehow lead to peace), Jewish worshippers are sometimes allowed to visit the Temple Mount during certain hours but are not allowed to openly pray. Rabbi Ariel is not the first Jew to be under investigation for disrupting the “delicate status quo.” Another fanatical Jew recently visited the Temple Mount. Yosef Hacohen, age 76, felt ill while touring the Temple Mount so he needed some water. Before drinking the water he said a blessing. Hacohen’s actions made members of the “peaceful and tolerant” religion of Islam angry. So naturally what did the Israeli police do? They arrested Hacohen. The Israeli police have even stopped Knesset Members from praying on the Mount. MKs Michael Ben Ari and Uri Ariel also joined a pilgrimage to the Mount to commemorate Jerusalem Day. While on the Mount, Ben Ari and a number of the other members of the group started praying. Police immediately asked Ben Ari to stop. After a number of the group refused to stop praying, they were arrested. Itamar Ben Gvir, spokesman for Ben Ari, accused the police of “doing the work of the Waqf." In recent years, Israeli police have also threatened activist for merely raising awareness of the need for religious freedom on the Mount. Rabbi Chaim Richman, Director of the International Department of the Temple Institute, who has a radio show on Israel National Radio, encouraged his listeners to write, call, or fax the Israeli government and request religious freedom for all on the Temple Mount. Rabbi Richman’s efforts got the attention of many people, including an officer from the US Embassy in Tel Aviv. The Temple Institute was established in 1987. No US government official has ever expressed interest in their work. But suddenly, after Rabbi Richman publically decried the fact that Jews were not allowed religious freedom on the Temple Mount, an official from the US Embassy couldn't wait to talk to Rabbi Richman about the "work of the institute." After Rabbi Richman was visited by the embassy official, he was also visited at night at his house by Israel's National Security Agency, known as the ISA or Shin-Bet. During the "visit," Rabbi Richman was told to desist from all his efforts to influence the public or the government into taking action on issues regarding the Temple Mount. His actions, he was told, were “damaging the relationship with the United States, placing a stumbling block in the path of the peace process, and inciting Arabs to violence.” He was then threatened with being arrested. Thankfully, secular and religious members of the public are speaking out against the recent actions of Israeli officials against their fellow-Jews. A demonstration was organized outside of the Prime Minister’s residence. Also, it should be noted that some members of the Israeli government are publically coming to the defense of religious freedom for Jews on the Temple Mount. MKs Uri Ariel, Aryeh Eldad, Danny Danon, Tzipi Hotovely, and Moshe Feiglin are among those who have been the most vocal regarding the recent actions of the police. Hopefully, their voice of passionate reason will be heard and acted upon. Israeli police add much to feeling just how powerfully, even in Israel, exile reigns supreme. We need Redemption now!